First and foremost, if you are riding a bicycle in New York, always wear a helmet. Period. There is just no excuse for not wearing a safety helmet. However, even when wearing a helmet, accidents and injuries do happen. Attorney Dunne can help. Groups like New York's Right of Way have done research to refute police officials' claims that bicyclists, not drivers, are responsible for most cyclist deaths. In fact, over 90% of cyclist deaths in NYC are the fault of drivers. Some bicycle accidents are also hit and run accidents. You need a lawyer who can handle all aspects of the claim. I will investigate claims relating to negligence on the part of car, truck, bus or taxi drivers who have run a red light, negligently turned at an intersection or crosswalk or who had been speeding at the time of the accident. Biking is a very popular in New York. Some people bike for exercise, some as their primary form of transportation, some for fun, some as part of making a living, such as delivery people or bike messengers. 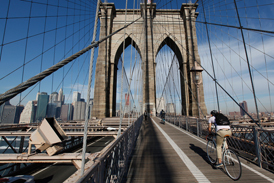 As a New York attorney, I have handled numerous bicycle accident cases. Do not assume that an accident or injury is your fault. For help with your bicycle accident case, call The Law Office of Robert Dunne, LLC for a free consultation at 212-551-1750 or contact me online. Before you answer any questions for any insurance company, contact me first. I may be able to help by investigating the accident scene, analyzing skid marks, the amount of damage to the bike, the amount of damage to the car and more. Insurance companies are only interested in protecting themselves. I want to fight for you and I will use my extensive experience and hands-on investigation in handling your case. I am not afraid to take on big insurance companies to build a strong case to get you the compensation you deserve. I will fight for justice and represent you aggressively throughout the process. I am on your side from beginning to end. If you are the victim of a pedestrian accident, call The Law Office of Robert Dunne, LLC for a free consultation at 212-551-1750 or contact me online.